Leveraging the world’s largest Agile assessment database, you can quickly and reliably instill a data-driven continuous improvement culture by benchmarking your efforts against the CA World Index, your specific industry and your own organization at different points in time. The results will provide you with a quick, yet comprehensive view of your company’s level of agility – from the team to the enterprise level - and help you make tactical, on-the-ground recommendations while shaping a long-term, enterprise transformation strategy. Gain insights into critical dimensions of agility, including Teamwork, Requirements, Planning, Technical Practices, Quality and Culture. 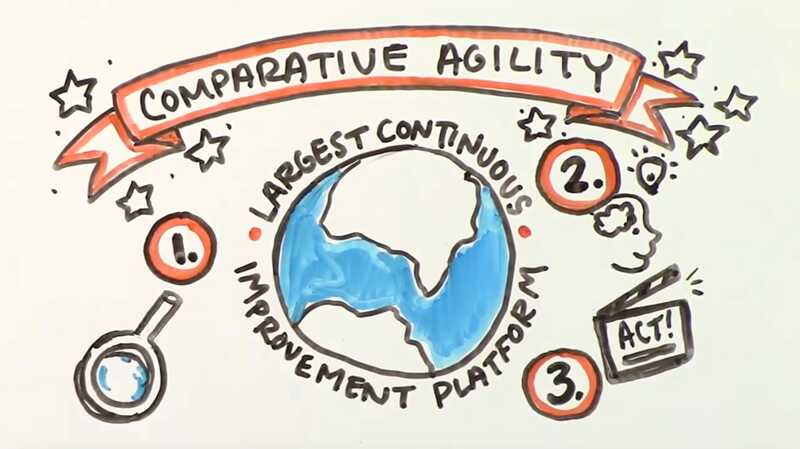 Prepared for a global environment; Comparative Agility is available in English, German, Spanish, Dutch, Russian, French, Norwegian, Chinese, Portuguese and Japanese. Business agility is not a destination – a company is never done “being agile.” Rather, becoming an agile organization entails continuously validating assumptions – and constantly learning to improve and adapting the way it operates. Our Comparative Agile assessment, focused on teams practicing agile and Scrum, will provide you with unique, industry-specific intelligence that inspires action. Created by thought leaders Mike Cohn and Kenny Rubin, Comparative Agile measures how teams perceive they are preforming across eight dimensions of agility. Management sets goals but doesn't tell team members how to achieve them. Requirements are represented at different levels of detail based on how soon the team expects to implement them. Technical team members and product owners collaborate in determining what features will be included in the release plan. Technical debt (i.e., accumulated undone or poorly done work) is made visible to both technical team members and stakeholders. Testers are involved and productive right from the start of each iteration. When faced with a situation where scope cannot be met with the allotted resources in the allotted time, the team's initial reaction is to prioritize and explore tradeoffs. Iteration reviews are attended by product owners, stakeholders, and team members who provide actionable feedback. Our customer(s) are more satisfied with the usability of our products than before.